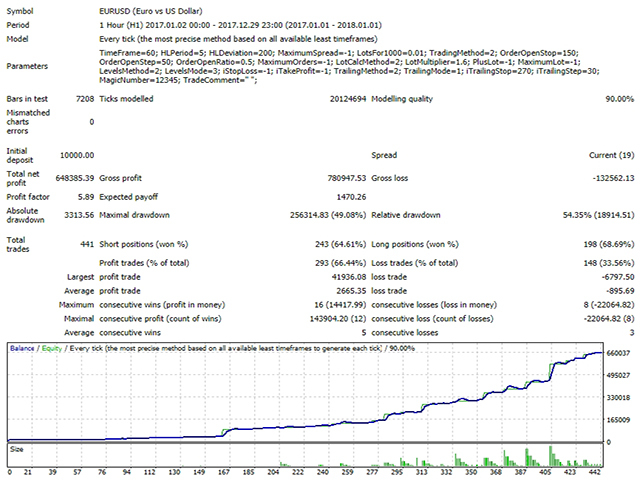 A multifunctional trading robot for MetaTrader 4. The EA's basic strategy applies the range of price deviation from the average high/low values for a specified period. It has a minimum of configurable parameters, but has great functionality - the Expert Advisor can be configured for any trading style, which makes it not just a trading robot but a multi-functional flexible constructor. The EA applies order levels, stop loss, take profit and trailing stop levels invisible for brokers. The entire trading process and detailed statistics are displayed on the chart as lines and in the information panel. TradeComment - comment to trades. убрана проверка на день недели из за которой было невозможно тестировать советник в не торговые дни.